Happy Valentine’s Day from Ellie. 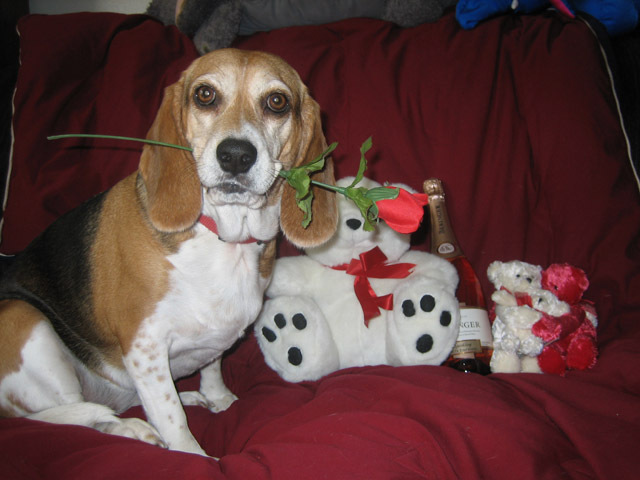 She has a rose just for you. I hope you have a lovely V-Day. Just remember, it’s not about waiting in line at the Olive Garden for a pre-fab meal or getting in a fistfight at CVS over the last Chocolate Heart or paying a 500 percent markup on six half-dead roses. It’s about letting the person you care about know that you’d gladly debase yourself for their romantic enjoyment. Buy an average priced bottle of wine, order in your favorite food, put your favorite movie in the DVD player, unplug the land-line and turn off the cell, dim the lights and spend this evening at home snuggled under a blanket.